Posted on May 25, 2014 by Admin. Parents, don’t despair. Even if your child spends four years of college reading Hungarian poetry or delving deep into the Faulkner oeuvre, he or she can still earn a decent salary shortly after packing up the senior-year dorm room. So says the National Association of Colleges and Employers, which reports that the top-paying liberal arts majors for 2014 graduates are foreign languages and literature (average starting salary $46,900) and English ($42,200). The results are based on job offers that students accepted earlier this year and were reported by employers in February 2014 primarily through a variety of government surveys. The lowest-paid? Criminal justice and corrections ($36,200). 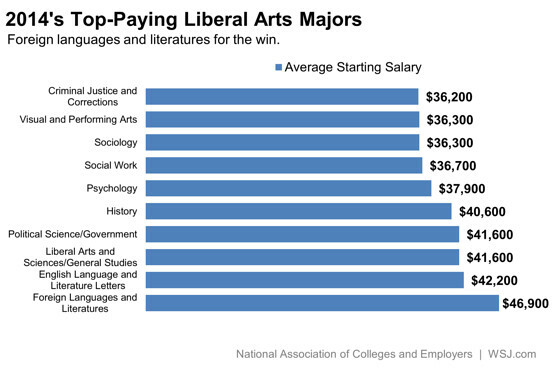 Even visual-arts majors did marginally better. “Employers hiring foreign languages and literatures majors did so primarily to fill elementary and middle school teaching positions,” according to the organization, which primarily represents companies that recruit on college campuses. Indeed, the educational services industry regularly scoops up the most new college grads, said NACE, which found that schools and other employers in the field hired 463,500 individuals awarded bachelor’s degrees in 2014, with an average starting salary of $40,894. The next biggest employer for this cohort was health-care and social assistance organizations, which hired 296,000 graduates (average salary $42,623). Employers hired English majors to work as teachers, editors, writers, managers, paralegals, and legal assistants, NACE said. In all, the average salary for all humanities and social-science majors was $38,365, up a healthy 3.5% from 2013. Engineering majors—the highest-paid of those tracked by NACE—saw their pay rise by just 0.3%, to $62,719. For all U.S. nongovernment workers, average weekly earnings rose by 1.5% from February 2013 to February 2014, according to the Department of Labor. Posted on May 18, 2014 by Admin. Looking to change your career path? Want to use your Japanese-English bilingual skills right here in the U.S.? Register now for the first ever Career Forum for working professionals featuring domestically-situated companies and positions. Participating companies are specifically seeking highly-qualified bilingual candidates ready to work in the U.S. Take advantage of this ground-breaking event and don’t miss a beat in finding new and exciting employment opportunities tailor-made to your skills. Posted in Uncategorized	| Comments Off on CAREER FORUM for Positions in the U.S.
Posted on May 10, 2014 by Admin. JapanCulture•NYC is proudly advertising free and strives to be the leading English-language resource for Japanese culture in New York City, highlighting the people and activities of New York’s Japanese and Japanese American community. From the arts to food to everything in between, JapanCulture•NYC looks for the best of Japanese culture the city has to offer. Have an idea for a feature or an event to promote? Send an e-mail with the details to info@JapanCulture-NYC.com. Classical pianist Kumi Matsuo, a post-graduate of the Royal College of Music and recent winner of the Louisiana International Piano Competition, adds a unique combination of grace and power to her interpretations of classical masterpieces. Kumi Matsuo was born in Tokyo, Japan. Kumi studied at the Toho Gakuen High School of Music and the Toho Gakuen University of Music in Tokyo. She completed the Artist Diploma course in 2010 and the Masters of Music program in July 2012 at the Royal College of Music (RCM) in London where she studied piano with John Blakely and Ashley Wass. She won second prize at the 75th Music Competition of Japan and third prize at the 22nd Cidade de Ferrol International Competition in Spain. In 2012, she was awarded first prize and the title of Competition Laureate at the finals of the 6th Isidor Bajic International Piano Competition in Novi Sad, Serbia. Copyright © Kumi Matsuo All rights reserved. Posted on May 8, 2014 by Admin. Admission includes a chance to win pair tickets to our Annual Sake Tasting (June 12)! Admission includes a chance to win pair tickets to the Japan Cuts 2014 Opening Night Screening and reception (July 10)! Admission includes a chance to win pair tickets for the Tadao Ando lecture (June 26)! Friday evenings from 6-9PM from May 16 through June 8, a cash bar will be open. A dazzling array of objects from the Brooklyn Museum’s collection of Japanese art comes together in this unprecedented collaboration between the museum and Japan Society Gallery. More than 2,000 years of art-making history are detailed in 71 paintings, prints, screens, sculptures, and decorative objects. The exhibition showcases the history of the Brooklyn collection while also illuminating its particular strengths in lesser known but revelatory artifacts like delicate bark fiber robes, beaded jewelry and wood carvings made by the Ainu people of northern Japan. Many objects are on view for the first time in decades, others for the first time ever. The works, framed around the four cardinal directions of north, south, east, and west, become points of departure from the myth of a homogeneous Japan. $12; students & seniors $10, Japan Society members & children under 16 free. Admission is free to all on Friday nights, 6-9 pm. Tues.-Thurs. 11 am-6 pm; Fri. 11 am-9 pm; Sat. & Sun. 11 am-5 pm, closed Mon. & major holidays. Starting Fri., March 7, through Sun., June 8, 2014, docent-led walk-in tours will be conducted Tues.-Sun. at 2:30 pm and Fri. evenings at 7 pm. Japanese language tours will be conducted Friday nights at 6 pm. Tours are free with admission and are approximately one hour in duration. Pre-K-12th grade school groups can schedule object-centered, one-hour Gallery lessons Tuesday–Friday by appointment. For more information about arranging group tours, please call (212) 715-1223. Two weeks advance request recommended. Japan Society Gallery Associate Cory Campbell leads listeners on an audio tour through Points of Departure: Treasures of Japan from the Brooklyn Museum. All exhibition-related programs are held at Japan Society. Finals are approaching fast, but that means so is summer! This Thursday, May 8th Baruch’s Japan Club will be holding our last event this spring, End of Semester Party. Take a break from studying for finals and join us in trying some good food, playing fun games and winning cool prizes. Anyone who is interested is welcome to join us! This event will be held in our usual room VC 10-165 during club hours (12:45PM to 2:05PM). Feel free to invite your friends to come! This week we are cosponsoring Baruch Photography Club’s event Be Happy, Don’t Worry! Come watch the live performances and view the mural of your photos. Submit photos to their Facebook page or send to their email baruchphotoclub@gmail.com. This event will take place onTuesday, May 6th from 12:30PM to 2:30PM in the multipurpose room. If you are attending, don’t forget to put your name on their guest listhere! Event Information:Event #1: Be Happy, Don’t Worry!